By Janet Muse, Central Missouri JH/SH Youth Camp Director, Warrensburg, Mo. 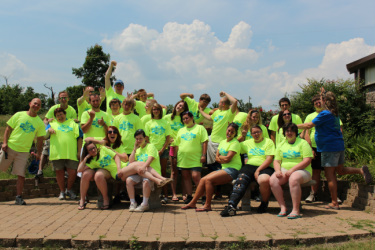 As the 2012 camping season geared up this summer, the Central Missouri high school youth took time to Pause in the midst of their camping experience to go out and help those in need through the Rebuild Joplin Organization. These high school youth set aside their traditional classes and craft time to travel 12 miles into Joplin each day. The camp theme this year was Pause- it only takes a committed second in the midst of your everyday life to begin a relationship with God. This second will then become more and more seconds, minutes, hours, days, and finally a life of following and talking with God. Joplin was in need of groups to go out and survey each home to find out what needs they were in need of, even a year after the 2011 tornado that changed so many lives. These high school youth graciously accepted the challenge set before them, of walking the neighborhoods and knocking on each door, as a result they got to hear some very devastating stories of the loss of loved ones, loss of homes, as well as miraculous stories of a houses untouched and blessings of life, etc. Through it all, they took time to Pause with God. The next opportunity was to help clean up and paint a church whose congregation were 90% elderly women and their grandchildren. The church was in great need of sprucing up. These high school youth tackled the challenge with God’s love. Dusting and polishing the wood interior, cleaning up trash around the outside of the church and down the sidewalk, painting doors, stairs, entry ways, and a ramp to beautify the church. We sure would have liked to have seen their faces come Sunday morning. Finally, an older couple graciously accepted help from our group on a day well above 100 degrees. Their daughter was working at Mercer hospital the day the tornado came through. They had stories to share while we were scraping and painting their home and garage. They told us of the many who lost their lives that day, stories of those affected by damage and loss, even those who decided to move out of the community entirely. Being at Mercer, allowed their daughter to touch and bless so many lives on that tragic day.